This class serves as a base class to provide a standard interface for a function that returns an object of a given (templated) type that depends on a PseudoJet argument. The rationale for using a class (rather than a pointer to a function) is that a class can be constructed with (and store) additional arguments. Definition at line 48 of file FunctionOfPseudoJet.hh. 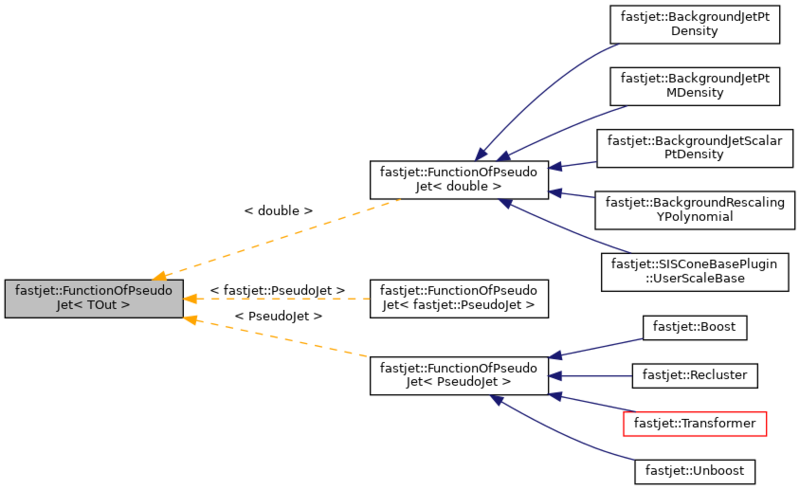 Implemented in fastjet::BackgroundJetPtMDensity, fastjet::BackgroundJetScalarPtDensity, fastjet::BackgroundJetPtDensity, fastjet::BackgroundRescalingYPolynomial, fastjet::Recluster, fastjet::Subtractor, fastjet::SISConeBasePlugin::UserScaleBase, fastjet::Filter, fastjet::CASubJetTagger, fastjet::Pruner, fastjet::JHTopTagger, fastjet::RestFrameNSubjettinessTagger, fastjet::MassDropTagger, fastjet::Transformer, fastjet::Unboost, and fastjet::Boost. apply the function using the "traditional" () operator. By default, this just calls the apply(...) method above. Definition at line 75 of file FunctionOfPseudoJet.hh. apply the function on a vector of PseudoJet, returning a vector of the results. This just calls apply on every PseudoJet in the vector. Definition at line 81 of file FunctionOfPseudoJet.hh.